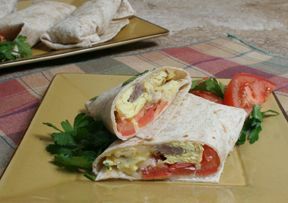 Eggs, bacon and hashbrowns rolled up to make a delicious breakfast burrito. Perfect for busy mornings. The salsa gives it just the right kick. Beat your eggs together with a small amount of milk. Melt margarine in pan or spray with cooking spray and add eggs. Microwave the bacon strips; drain. Fry hashbrowns, if desired, until done. 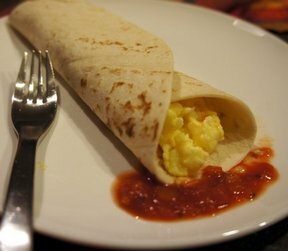 Wrap up your tortillas in a paper towel and warm in the microwave. 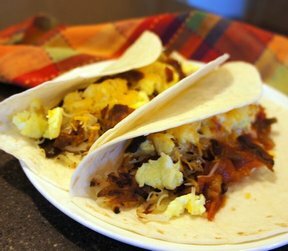 Top tortillas with the eggs, hashbrowns, bacon and cheese. Serve with salsa. Roll up the tortillas and enjoy. "Great recipe. I used pre-cooked sausage crumbles instead of bacon. Perfect for school days for the kids."